On Sunday, I “moved” to Seattle. I put move in quotes because right now my apartment is furnished with a queen sized air mattress, a cardboard box for a table and a 12-pack in the fridge. No TV, no Internet, no furniture. Fortunately, my downtown Seattle apartment building (pictured to the right) has a resident lounge and rooftop deck, complete with TV, wifi and furniture. I’m spending a lot of time there. When I’m not out exploring my new ‘hood. Sunday afternoon and Monday evening were spent walking around the neighborhood. I think the only thing keeping the apartment from being a 100 is the fact that the closest school is a whole half a mile away. All that (and more — including my office) all within 440 yards of the place. 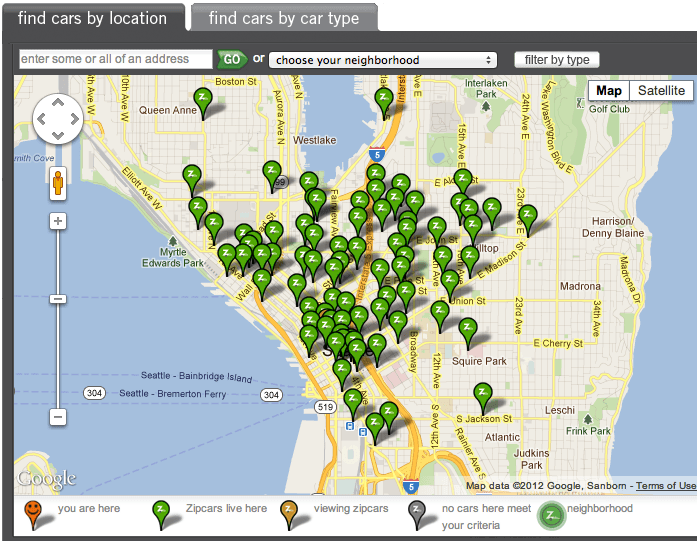 WalkScore lists 618 amenities within a one mile radius of my address. I have yet to be unable to find anything I need within a short walk. Well, I do need an ironing board, but that’s pretty low on the priority list. I’m thinking I don’t even need to bring my car up here. Why pay for city parking, gas, insurance, and monthly car payments when I can walk to anything? And if I need a car or truck, I can get a Zip Car for $10 – $12/hour. There’s a few of their cars scattered about downtown Seattle, including two that reside in my apartment parking garage. Failing walking or Zip Car’ing, there is always public transportation. My place has a Public Transportation Score of 100. I’m digging the urban lifestyle. Maybe just because it is so different than living in suburbia. Maybe because it’s new. Maybe I’ll get sick of it at some point. Stay tuned here as I’m sure I’ll be writing more on my urban experience. Congrats again on the new opportunity – enjoy every moment! Seattle is a great example of a city designed around people and not cars – more cities should follow Seattle’s lead. Sadly the way things are going all we get are endlessly expanding suburbs all over the country.